Risk Management System Development using LOW COST "Add-In Toolkits"
A perennial problem in software development is how to access common algorithms (e.g. analytical models for derivative pricing and risk management sensitivities) when working on different systems without re-inventing the wheel every time. Spreadsheet modelling environment, e.g. using Microsoft Excel. Risk Management system, e.g. where the data is held in a database, e.g. Oracle, Sybase, Microsoft Back Office etc. Lowers the learning curve when developers move from one system to another. The option to outsource the development of some of these algorithms (e.g. exotic option models) to specialist software houses. This could reduce costs, provide extra flexibility and implement new market tested analytical models. Prior to the establishment of Microsoft Windows and enterprise computing, it was very difficult to set up such common algorithms because the base platforms were very different. For example the modelling environment may have been Lotus 1-2-3, while some front office systems may have been written in DBASE language, while the risk management system may have been running on a UNIX based system. In these environments, the same compiled code could not run, therefore internal standardisation based on a common source code library (e.g. "C") was often used. However systems may be written in different programming languages (e.g. Cobol, Fortran, C, Pascal etc.). Also, the same source code compiled in different environments may behave differently (generally due to obscure bugs or implementation variations in the different compilers). Low cost libraries from third-party software houses were also uncommon since, in the financial sector, there tends to be great secrecy on how algorithms are implemented (even if the underlying theory was widely published). Also, the different target environments for these libraries fragmented the market, reducing potential economies of scale. A common compiled library of routines which can be called from environments written in another language. Linking of libraries with local or enterprise databases via the use of ODBC standard (Microsoft's Open Database Connectivity). Mass market enables economies of scale to develop. Option Model (0= Black Scholes, 1= Binomial on Cash, 2= Black, 3= Binomial on Futures etc.). As a convention, MBRM uses the first 3 letters of the function name to identify the add-in toolkit used (e.g. functions beginning with "UEA" would refer to the "Universal Exotics Add-in"). Excel, C and Visual Basic would all call the same compiled library code. MBRM also bundle their libraries with some front end spreadsheets developed in Excel which call the common library (e.g. to perform portfolio revaluation and risk analysis). These spreadsheets, which can be linked to real-time feeds, are for users looking for "off-the-shelf" pricing and risk management software. 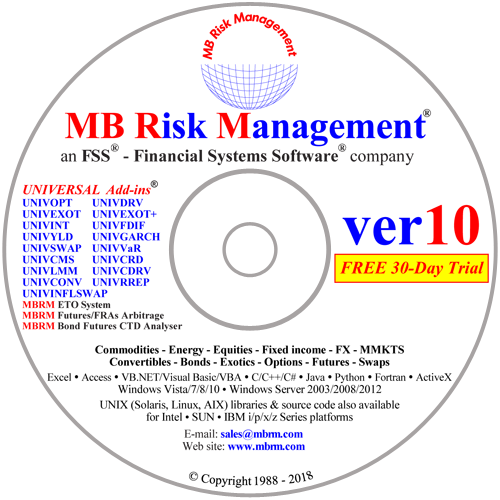 If a financial institution also requires source code libraries, then MBRM can provide, at additional cost, the source code for their Add-in Toolkits. This has the advantage that the financial institution would be buying in the tried and tested source code which is used by over 30,000 users world-wide. This "economies of scale" of one library for all environments has enabled MBRM to substantially reduce its prices over the last few years and add increased functionality as standard. In conclusion, I believe that the "Add-in Toolkits" provide an open ended, flexible and low cost approach to assisting in building risk management systems. The ability to pick from, compare and combine libraries from different software houses is very beneficial. Dr. Mamdouh Barakat is Founder and Managing Director of MB Risk Management.